Our small Tack Shop is crammed full of riding essentials from hats to boots, lead ropes to grooming kits! 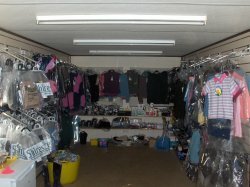 We stock quality items for both horse and rider at affordable prices. We have regular orders to our suppliers so if we don’t have a particular item in stock we will try our best to get it, usually within a few days. From our Tack Shop, hot and cold drinks are available, often a must have after an energetic riding lesson or a ‘warmer’ in cold weather for patient parents.